That night I couldn't sleep and was obsessed with repainting that dresser, I watched about a dozen Youtube videos on how to do it. I made some decisions about how I wanted to do it, and I made a list of supplies I'd need. I finally went back to bed at 2, and was asleep by 2:30. Rob indulged me the following day by taking me to the paint store and getting everything on the list. (Tangentially, the paint store guy told me that they can put any color paint you want in a spray can!) 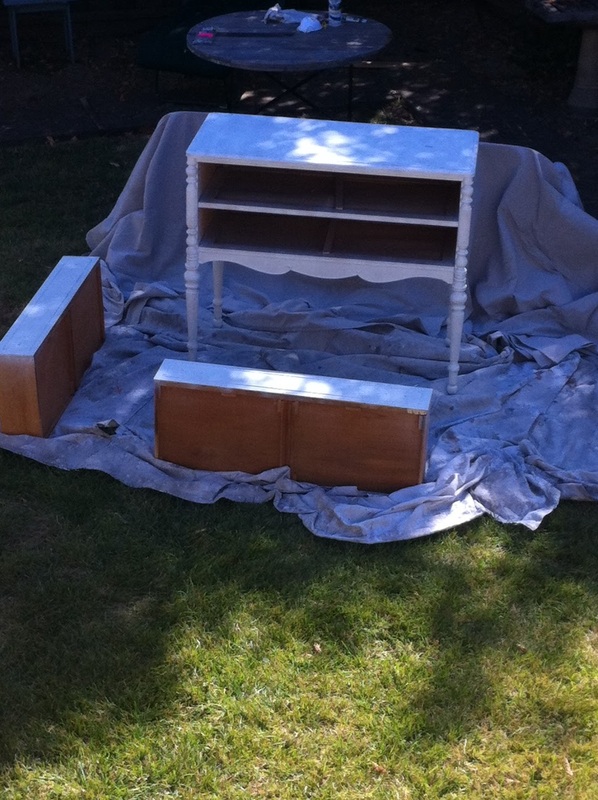 Rob then set up a work table with the dresser outside so all I had to do was sit down and start sanding. I didn't start sanding, though. It seemed kind of depressing to do it alone, especially since I really don't know what I'm doing, in spite of Youtube's best efforts. Yesterday, a friend of mine who has experience doing this stuff came over to help. How awesome is that? She just went down into the yard and started sanding. It was so easy! I thought sanding would take forever, and it was the easiest part! She pointed out that when you are sanding for repainting, its not that big a deal versus sanding for staining. Easy! Then I primed the thing! I couldn't believe it! 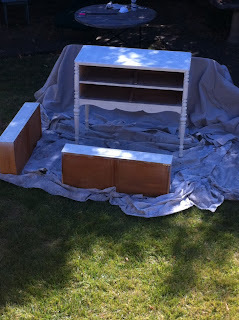 I feel like, when my body is back to normal, I could refinish furniture every day! I really wanted to paint it, too, but by the time it was primed, I couldn't even sit anymore, let alone stand, and it seems to have wiped me out for today too. So maybe this weekend it will get painted and sealed and I will have a custom piece of yellow furniture for my front hallway! So excited!!! Here it is half done. Not a great pic since I couldn't drag myself all the way down there. Love it!!! How Many Cupcakes is Too Many Cupcakes?